CRABZILLA ALERT! Huge 50ft Giant Crab Has Been Discovered Off The Coast Of England! IT'S CRABZILLA! A 50ft man-eating (this has yet to be confirmed, but we're running with it) monster giant crab has been discovered lurking offshore on the coast of Whitstable, UK. Dubbed "Crabzilla" because of course it is, photos of the huge beast have appeared online and unconfirmed sources have reported that local residents have been freaking out and leaving the area in fear of their lives. Meaning it simply MUST be true. Renowned sea-life expert Dr Verity Nye, who has spent his career working on logging new species of crab, has made a statement saying that "Crabzilla is impossible". But what does he know, has he seen this new evidence? 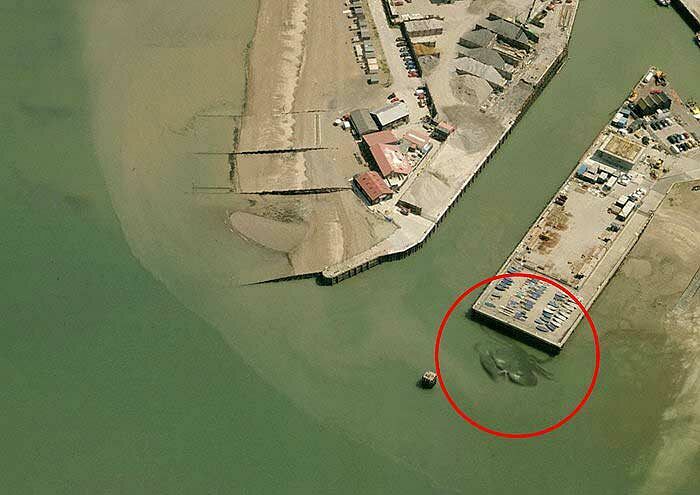 Images show the crab in the waters off Whitstable harbor in the county of Kent, England—and it completely dwarfs the boats shown next to it leading people to believe it must be at least 50ft wide. Local fishermen have spoken of seeing strange, large forms scuttling across the harbor when the sea mists come and engulf the town. Could Such A Thing Like Crabzilla Be Real? 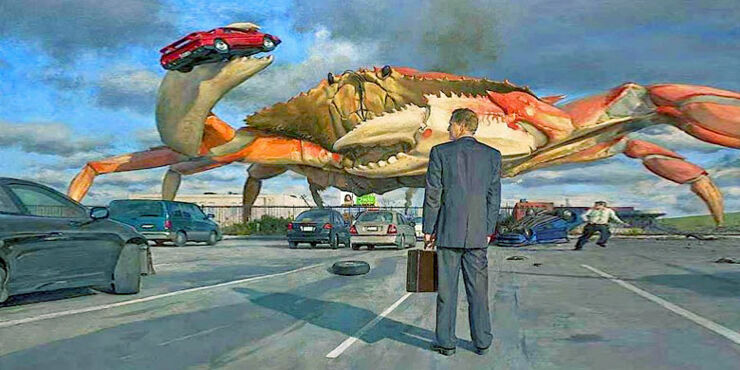 Artists rendition of Crabzilla the giant crab attacking the town of Whitstable. Sometimes when the sea mists recede, there are reports of people going missing. Add to that all the strange crabby-like burping noises far out at sea that confirm without any shadow of a doubt the giant crab threat. Actually both of those last those sentences are a lie. But it would be spooky if they were true, wouldn't it? Plus, let us not forget there is a nuclear power station located in nearby Dungeness, we've all seen enough giant monster movies to know what that means, so there can be no doubt at all that radiation has leaked into the local water and created giant mutant crustaceans who will soon swamp the land and head for London. Then head to the British parliament where they'll request a halt to all this Brexit nonsense and demand their smaller, tastier brothers and sisters aren't mercilessly taken from their watery home, boiled, and served to day trippers with a lovely fresh salad. And maybe even some lemon mayonnaise. Who knows? Conclusive proof that Crabzilla the giant crab exists. Aerial images first appeared on Weird Whitstable, a site set up by local artist Quinton Winter to monitor strange and unexplainable events in the area. He told British newspaper The Express that he was sent the image and thought it was fake, but now claims he's seen the monster himself when him and his son went crabbing. "At first all I could see was some faint movement, then as it rose from the water I thought, ‘that’s a funny looking bit of driftwood." Winter stated. He went on to report "It had glazed blank eyes on stalks, swiveling wildly and it clearly was a massive crab with crushing claws. Before this incident I thought the aerial photo showed an odd-shaped sand bank. Now I know better." Seems totally legit to me. And if you are still in doubt after hearing Quinton's terrifying recount of his experience then we offer you more conclusive proof of the existence of this giant crab, especially with the shocking news below that seems to indicate that Crabzilla has developed a taste for human flesh. Young innocent human flesh. Crabzilla the giant crab prepare to eat small innocent children. And on the Weird Whitstable blog further conclusive proof of crabzilla's existence. 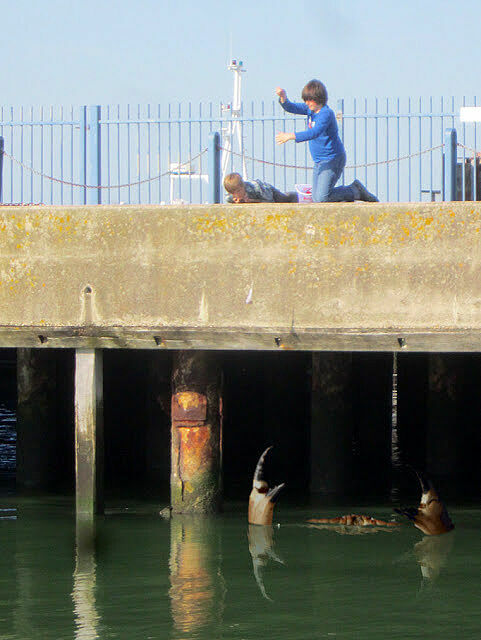 The blog shows an image (below) of the giant appearing beneath two children with the caption: "This shocking image of a giant crab under a popular crabbing spot in Whitstable was taken last weekend. The boys were unaware of the danger, but as several passersby shouted to them, the crab slipped silently away under the water, into the dark, sideways." There's no scientific proof to say the giant crab is real and it's highly unlikely the images were created in photoshop and it's nothing but a hoax, after all, who would do a thing like that on the internet in this day and age. No one, that's who. It doesn't bear thinking about? But dismissing the claims of all those non-believers we choose to believe it's real. Because we want to. The fact that this article has appeared so close to April Fools Day has no bearing on this terrifying even at all. Don't be surprised if crabzilla crops up in the next Godzilla movie, in a scene where the two do battle in the Thames river that flows through London, eventually spilling over into the city and devastating the Queen's home. 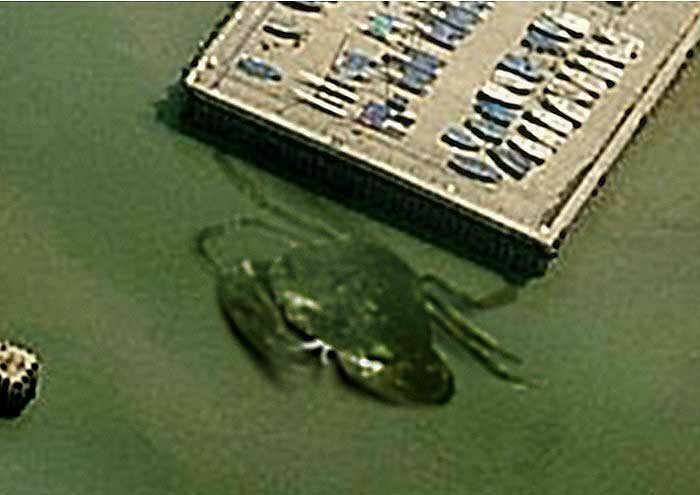 Ariel photograph of Crabzilla the giant crab in Whitstable harbor.